Gen Paul L. Freeman, Jr.
LTG Arthur S. Collins, Jr.
"The Big Picture" was a US Army Public Affairs television series in the 1950s and 60s covering a wide range of subjects, telling the Army's story in history and in current events. 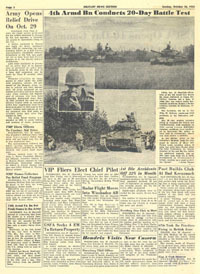 Good report on the US Army in Europe in the 1966 timeframe with heavy focus on Headquarters in Heidelberg, the 4th Armored Division and the 8th Infantry Division. High quality video - very sharp! Out takes show additional scenes that include the Airborne school in Wiesbaden and a river crossing during a field exercise. Effective 1 July 1945, Headquarters ETOUSA was redesignated as Headquarters, United States Forces, European Theater (USFET) , and one month later the communications zone organization lost its wartime title when ii was redesignated as Theater Services Forces, European Theater (TSFET), a counterpart of Army Services Forces in the United States. USFET headquarters was located in Frankfurt, Germany, as were the most important TSFET functional centers. 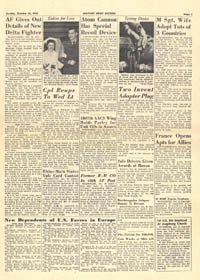 In the spring of 1948, Headquarters EUCOM moved from Frankfurt to Heidelberg so as to provide space in Frankfurt for the agencies created as a result of the merger of the British and U.S. occupation zones. To make room for Headquarters EUCOM in Heidelberg, the Constabulary headquarters moved to Stuttgart. Both moves ware completed in early 1949. 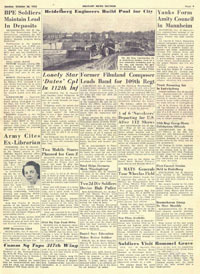 By the end of 1949, the Berlin Blockade had officially ended (12 May); General Huebner had replaced General Clay as the Commander in Chief, EUCOM (15 May); U.S. Forces, Austria, had become an independent command under the Joint Chiefs of Staff, (23 May); the Headquarters, Office of Military Government for Germany (U.S.) had moved from Berlin to Frankfurt (12 August); General Handy had assumed duties as Commander in Chief, EUCOM and as Commander in Chief, USAREUR (2 September); and Mr. J.J. McCloy had became the U.S. Military Governor and the U.S. High Commissioner for Germany (HICOG) (12 September). 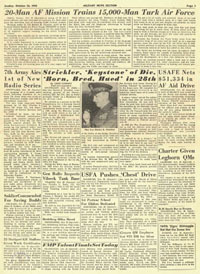 On 24 November 1950, EUCOM activated Seventh Army with headquarters at Stuttgart to take over from USAREUR the command and ground service forces. Other USAREUR functions reverted to EUCOM. USAREUR continued, however, to function without troops, so as to satisfy certain legal requirements, such as those associated with courtmartial responsibilities. On 10 October 1952, Headquarters, USEUCOM began to move from Frankfurt, Germany, to the vicinity of Paris, France. 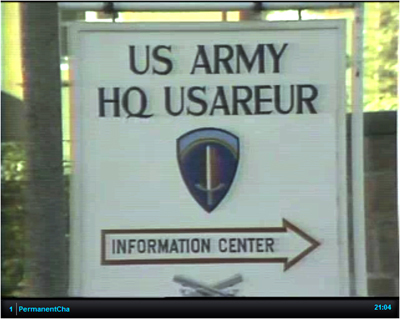 On 1 December, the Communications Zone, with headquarters in Orleans, France, became a USAREUR major subordinate command. 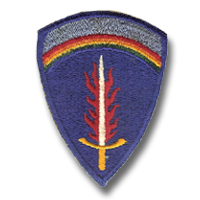 In October 1955, the last of US troops withdrew from Austria and the US Army Southern European Task Force (USASETAF) with headquarters in Vicenza, Italy, was established as a subordinate command of USEUCOM. 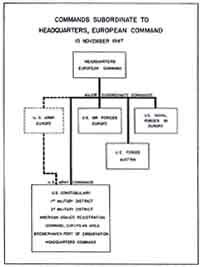 On 1 January 1956, USASETAF was made a USAREUR subordinate command. On 1 December 1966, USAREUR and Seventh Army headquarters merged at Heidelberg, the USAREUR headquarters being redesignated Headquarters, United States Army, Europe and Seventh Army. Germany. They provide a reflection of what life was like for the soldier in Europe in the mid-1950s. Thoughts on USAREUR and its role in the defense of Europe by a young second lieutenant on his way to his first European assignment - with a Battle Group in Bamberg, Germany. An extract from the personal memoirs of COL Basil J. Hobar who served three tours of duty with USAREUR during his Army career. Click here to read his recollections (PDF file). COL Hobar has previously provided some information on one of his other assignments in Europe - with the US Army Supply and Maintenance Agency during FRELOC. 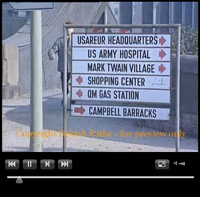 On 15 Nov 1966, as a consequence of Operation FRELOC, HQ USAREUR moved the USAREUR (Main) Wartime headquarters from Maison Fort, France, to Karlsruhe. Concurrently with that move, the command's Emergency headquarters was also moved from Verdun, France, to Karlsruhe. By 15 Dec, USAREUR (Main) headquarters was ready to open in a selected field location on order of CINCUSAREUR or at the appropriate state or stage of alert (OPLAN AE 102). To meet the requirements for wartime main (USAREUR (MAIN) and alternate (USAREUR (ALTN)) headquarters, USAREUR developed the new concept of pre-surveying and selecting a number of possible sites which, like wartime QRA Pershing sites, would not be improved or occupied before the outbreak of hostilities. In September 1966, USAREUR surveyed and selected sites lying along the communications axis in the western areas of the FRG. It pre-positioned transportable communications equipment and personnel in existing US facilities, where they were ready to deploy to a designated headquarters site at short notice. USAREUR Hq announced recently that four of its subordinate headquarters will be eliminated in the next 18 months as part of the Defense Secretary's plans to beef up US ground combat forces in Europe. Functions of the Combat Support Comd will be absorbed by various USAREUR Hq agencies. The European Office, MATCOM's functions will be taken over by TASCOM Hqs. The MIS Support Agency will be phased out. To improve conventional combat forces in the European area, four combat support units, comprising about a thousand men and new-model equipment, were deployed during the period. The Chaparral/ Vulcan Air Defense Battalion of the 1st Infantry Division was deployed along with a supporting Ordnance detachment and two attack helicopter companies equipped with AH-1G Cobras; these units were organized, trained, and deployed from 13 November 1972 to 24 January 1973. Five forward area alerting radar platoons were also organized, trained, and deployed to Europe to augment the capability of existing Chaparral/ Vulcan air defense battalions, and an assault support helicopter company with CH-47 craft and two medical helicopter air ambulance platoons with UH-1 H helicopters were also deployed. Under Project FENDER, the ratio of combat units to support units was improved without increasing U.S. Army strength in the theater. This so-called "tooth-to-tail" relationship was achieved through mergers, reductions, inactivations, and an aver-all streamlining of headquarters and logistical functions. Personnel economies were used to improve the combat forces, two tank battalions and an airborne battalion combat team were activated, and a 105-mm artillery battalion was converted to a 155-mm. 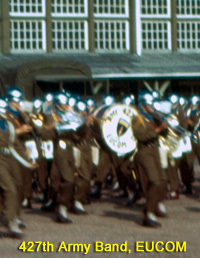 battalion. In 1978, the Comptroller General issued a report titled "Benefits and Problems Associated with Improving the Ratio of U.S. Combat Troops to Military Support Personnel in Europe." The report described the implementation of Public Law 93-365, Section 2 (known as the "Nunn Amendment") and its impact on combat capabilities in Europe. The following is an excerpt from the unclassified (somewhat redacted) version of that report. ... Because of continuing improvement in Soviet and Warsaw Pact capabilities in recent years -- particularly to conduct "Blitzkrieg" warfare -- the United States has undertaken programs to improve its combat effectiveness in Europe. Some of the programs have increased the ratio of combat troops to support forces without increasing overall US military forces in Europe. One program to convert headquarters and military support personnel to combat personnel was prescribed by an amendment to the Fiscal Year 1975 DoD Appropriations Authorization Act. This amendment is referred to as the "Nunn Amendment" after Senator Sam Nunn, who was a moving force behind it. It required a reduction of 18,000 in authorized support personnel -- contrasted to personnel on hand -- in the services in Europe during Fiscal Years 1975 and 1976. In conjunction with these reductions, 13,435 combat spaces were added in Europe through the end of FY 1976 by increasing personnel in existing units and by deploying new combat units. An addtional 4,000 combat spaces were added by the Air Force in FY 1977. While more combat units and increased manning in existing units provided added capability to meet the threat of short, intense war, these gains were not achieved without a deterioration of some wartime combat support capabilities, particularly in the Army. Some of the support reductions had a direct adverse impact on combat support capabilities. Others, together with the shrinking US support base over the past several years, have resulted in greater need for increased host nation support (1), including use of foreign national civilians and contractual support -- areas that could have a potential adverse impact on wartime capability. Some non-combat areas (2) were excluded by the Army from consideration for reduction. 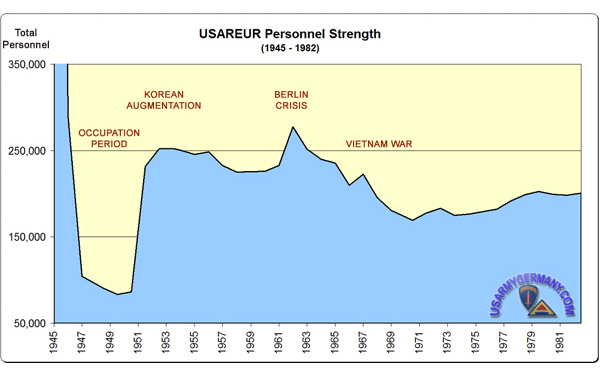 As a result, other support positions more essential to wartime needs were reduced. For more details on the impact of the Nunn Amendment on USAREUR, click here. (2) In the early stage of planning for the Nunn Amendment, the Army decided not to reduce positions in two areas -- US military community support and non-combat positions at the division level. Community support includes many functions such as commissary and postal services, recreation, libraries, transportation services, and education programs for which there is little or no wartime need. Community support was omitted to avoid lower morale and support to the soldier and his family. On 2 September 1949, General Thomas T. Handy assumed the position of Commander-in-Chief of United States European Command (CINC EUCOM). He succeeded General Clarence R. Huebner. 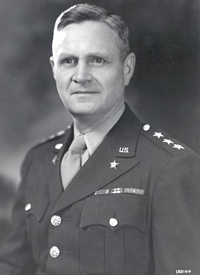 Lt Gen Huebner had become Acting CINC EUCOM on 15 May 1949, after Gen Lucius D. Clay's (previous CINC and Military Governor of the US Zone) departure for the US. 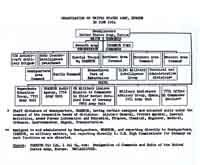 (In July 1949, the positions of CINC EUCOM and Military Governor were separated from each other with John J. McCloy taking over the Military Governor role as well as that of US High Commissioner for Germany.) Gen Huebner was reappointed Deputy Commander in Chief and Chief of Staff, European Command. General Handy's assumption of the European Command marked the first permanent separation of the Military Governor and the Commander in Chief. Under the revised directive, CINC EUCOM received instructions directly from the Joint Chiefs of Staff and reported to the JCS through the Chief of Staff, US Army. CINC EUCOM exercised unified command over all forces allocated to him by the Joint Chiefs of Staff or other authority. Before the end of 1949, the last two named commands were dropped, when USAF was made a separate command responsible directly to the Joint Chiefs of Staff and OMGUS was phased out. With the enumeration of USAREUR, USAFE and USNAVFORGER as the three major commands of EUCOM, EUCOM Headquarters became, in effect, a joint headquarters. 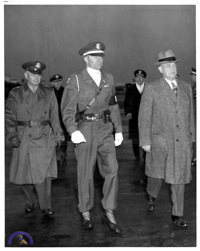 Gen Thomas Handy (left), CG US Army Europe,; CAPT Wilfred C. Hinman (center), 61st Air Police Squadron, Comander of Troops for the Honor Guard; and Mr. Louis Johnson (right), US Sec. of Defense; inspect the Honor Guard composed of Air Force, Navy and Army personnel. Honoring the arrival of Gen Omar N. Bradley and Sec. Johnson from Philadelphia where they were guests of the Army-Navy Football Game the day before. Gen Omar Bradley and Sec of Defense Louis Johnson arrived at Rhine Main to confer with High Commissioner of Germany, John J. McCloy, before going to on to London and Paris for conferences with the Atlantic Pact Nations on their defense. Mr. Ingo Wolfgang Trauschweitzer teaches at Norwich University in Vermont, the oldest private military college in the United States. 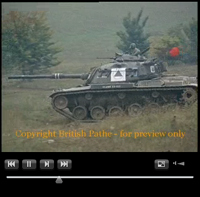 Creating Deterrence for Limited War: The U.S. Army and the Defence of West Germany, 1953-1982 (Warning: 4.5 MB) A Unit History. Chapters 4, 6, and 7 of the dissertation deal primarily with issues specific to USAREUR (and NATO), while the other chapters are heavier on US policy and strategy for the Cold War. To read an abstract, click here. Ingo is very interested in hearing from USAREUR veterans (and those of other services also) - if anyone wants to comment on aspects of the dissertation, please feel free to contact the webmaster (Walter Elkins) or the author (Ingo W. Trauschweitzer) directly. Comments, suggestions, and corrections are very much appreciated! Two wonderful books that I use on a regular basis as a standard reference for identifying DUI's and patches to add to the unit pages of my website have been written by Barry Jason Stein. 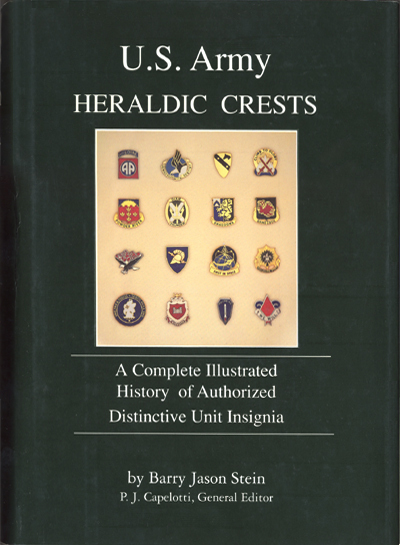 Barry's background as a salesman and later owner of a major military insignia manufacturing company and his great interest in military history have made him uniquely qualified to research and compile these great reference volumes. SHAPE The senior NATO Command was formed on 2 Apr 1951. AFCENT A NATO Command formed 20 Aug 1953 and subordinate to Supreme Headquarters Allied Powers, Europe. AIRCENT A NATO Command formed 20 Aug 1953 at Fontainebleau, France, and was subordinate to HQ Allied Forces Central Europe. CENTAG Central Army Group (CENTAG) Plans Staff began working on Campbell Barracks within the U.S. Army Europe staff in 1952. NORTHAG Northern Army Group (NORTHAG) was formed on 1952.11.29 with BAOR as its main element and C-in-C BAOR always as its C-in-C NORTHAG. 2 ATAF A NATO Command formed in 1958. 4 ATAF A NATO Command established in April 1952 in Landsberg/Lech, Germany. AAFCE Established on June 28, 1974 at Ramstein Air Base, as a principal subordinate command under Allied Forces Central Europe (AFCENT). The CENTAG Plans Staff formed into a separate headquarters (separate from HQ USAREUR) in April 1959. The Supreme Allied Commander, Europe, formally activated the CENTAG Headquarters on Oct 1, 1960. 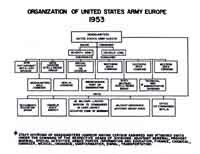 On 19 January (1952), the Supreme Allied Commander, Europe (SACEUR), notified the US Secretary of Defense that it was his ultimate intention to constitute two army groups within the Central European command. 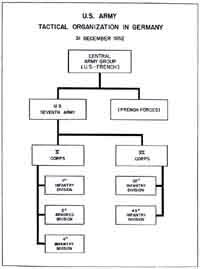 One of these groups, composed of French and US troops, was to be placed under US command, and the second group, composed of Belgian, British and Netherlands troops, under British command. SCAEUR proposed to activate the headquarters of the French-US army group in nuclear form as soon as possible and to build it up as rapidly as the necessary staff and equipment could be made available. The headquarters of the Belgian-British-Netherlands army group was to remain on a skeleton basis within the existing headquarters of the British Army of the Rhine (BAOR) until a later date. SACEUR requested that Gen Thomas T. Handy, Commander in Chief, European Command, be made available for assignment as the commander of the French-US army group in addition to his other duties. At the same time that the request was made to the US Secretary of Defense for assignment of General Handy, a similar request was made by SACEUR to the British Ministry of Defense for agreement to assignment of Lt. Gen. Sir Charles Harding, Commander in Chief, BAOR, as commander-designate of the Belgian-British-Netherlands army group. The Standing Group of the North Atlantic Treaty Organization approved the formation of the two army groups, which were accordingly established in skeletonized form and attached to BAOR and USAREUR, respectively. Under the direct supervision of AFCE, the three subordinate commands prepared a Central Europe Joint Emergency Defense Plan (JEDP) which coordinated the operations to be performed by NATO land, naval and air forces in Western Germany or in an expanded area if the exigencies of war made it necessary. Production of a single plan was a decided improvement over previous procedure, under which each of the three service commands prepared a plan and by subsequent coordination produced a joint plan. Since US representatives were on the staffs of all the afore-mentioned NATO commands and participated in their planning programs, the ideas of US military forces were incorporated in all these plans. USAREUR came directly into the NATO command structure through the Central Army Group (CENTAG), a combined US and French headquarters which was operational for planning purposes only. CENTAG was immediately subordinate to LANDCENT. In the event of war, USAREUR combat troops would form the US element of CENTAG and CINCUSAREUR would assume command of CENTAG. The CENTAG Plans Section prepared the Central Army Group European Defense plans in support of LANDCENT and AFCE plans. The US Seventh Army and the First Fench Army, in their roles as NATO forces, prepared operational plans in support of CENTAG emergency defense plans. 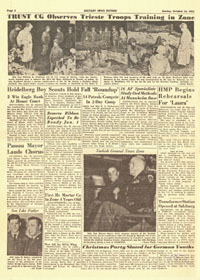 The CENTAG Emergency Plan 1-52 issued on 31 December 1952 was in effect throughout 1953. It was superseded by the CENTAG Emergency Plan 1-53 on 31 December 1953, effective for 1954. 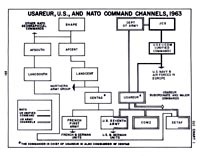 Each plan and its annexes contained instructions for establishing a command headquarters and for waging land warfare in Central Europe whenever the US and French components of CENTAG were placed under the control of NATO commanders. 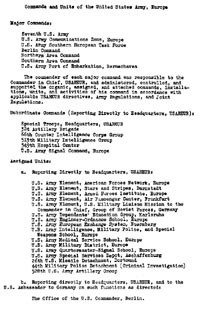 The two plans were modified as conditions changed; for instance, troop lists were modified to reflect current manpower situations. During 1954, the (Plans) Section was preparing CENTAG Emergency Plan 1-54, a plan to support the Central Europe Joint Emergency Defense Plan 1954, and whose completion was expected by the end of the year. All of these NATO defense plans and their accompanying annexes were classified cosmic top secret. ATTENTION! Articles, photos and other materials appearing in the STARS & STRIPES fall under the same copyright and trademark regulations as "non-government" publications. Please contact the STARS & STRIPES to obtain permission prior to using any of their materials. 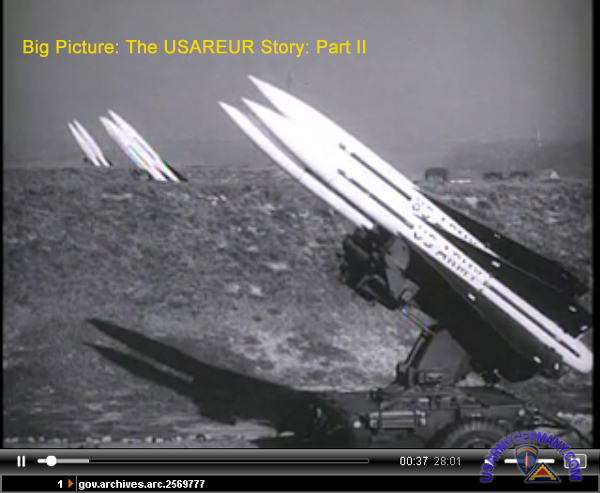 So, now pull up a chair, grab a cup of joe, and enjoy a trip down memory lane as we get a glimpse of activities within USAREUR through the pages of the STARS and STRIPES . 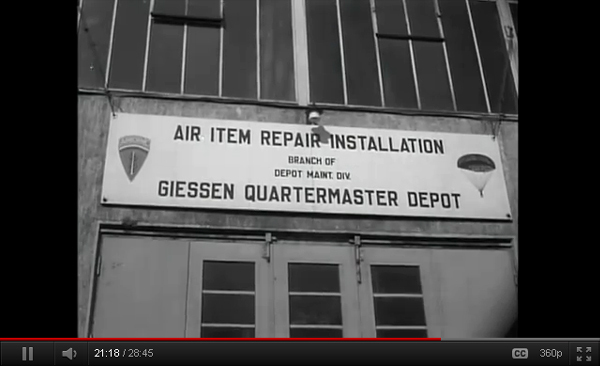 . .
the time: October 1952 . . .
the place: USAREUR, the "Zone," Deutschland . . .
the environment: troops face constant alerts and training in the field; the German winter is on the horizon; and over 250,000 US soldiers, and their families, settle in to their new surroundings as the "Defense of Western Europe" phase of USAREUR's history begins . . . THE military defenses of western Europe, under the North Atlantic Treaty Organization, stretch in an immense arc from the northern tip of Norway to the eastern borders of Turkey. The vital sector of this arc -- the keystone of European defense -- extends from Jutland peninsula to the Alps and from the Iron Curtain to the Atlantic. It is within this sector and in northern Italy that the United States Army, Europe lives, trains and operates. Here the main elements of America's massive contribution to ground defenses of Europe are concentrated. This territory is, perhaps, the most valuable piece of real estate in Europe. It contains the mines and factories, the fields, farms, port facilities and waterways, the communications and commercial facilities that, combined with American aid, provided the basis for Western Europe's economic recovery after World War II. A mere recital of the names of some of the cities found in this area - Munich, Stuttgart, Mannheim, Frankfurt, Nürnberg - known throughout the world for their production of textiles, chemicals, automobiles, aircraft motors, machinery, electric goods, precision instruments, railroad equipment, iron and steel - re-emphasizes the importance of the region. In Western hands, all these provide assets for the waging of peace, for prosperity and for security. In Communist hands, their loss would mean the collapse and death of Europe. The position and the mission of USAREUR are clearly defined. Within the framework of NATO, its number one job is to train, equip, and maintain a combat-ready field army on the continent of Europe. Our paramount concern - as I have said many times and re-emphasize here - is the ground combat soldier. He is the focal point of all our efforts. Organizing, equipping, training, sustaining and supporting him so that he can perform his indispensable role in combat is the Amy role. This role is equally significant in any kind of war - hot or cold. It is just as important in general war as in limited war. Beguiled by the mechanical marvels of the age, it is easy for people to forget the true character of the ground combat soldier's role in war. When free men have been so beguiled in the past, they have slipped back into vassalage. THE very core of United States Army, Europe (USAREUR) is the Seventh Army which, "born at sea, baptized in blood and crowned in glory" fought through France to victory in Germany in World War II, remained for a time as an army of occupation, and was reactivated in 1950 to become the first effective foundation stone in the Free Word's wall of defense against Communist aggression. Throughout the years, Seventh Army has kept pace with advances in tactics and techniques, with constant additions of new weapons and the most modern equipment. So rapid have been these advances --- and the effective reorganization to meet modern requirements -- that less than four years ago the Seventh Army was able to announce proudly that it had become "the world's first pentomic army." 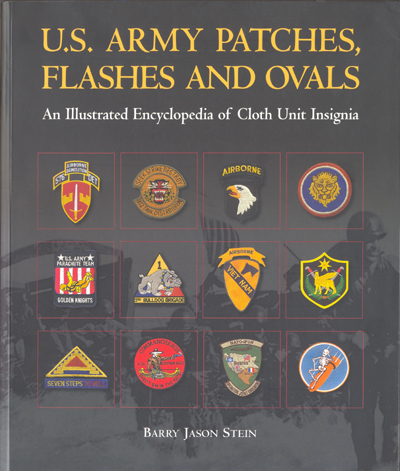 The American elements of Seventh Army are the two Corps, V and VII, five divisions - 3d Infantry, 8th Infantry, 24th Infantry, and the 3d Armored and 4th Armored - the 2d, 11th and 14th Armored Cavalry Regiments, and the 4th Armored Group. The combat records of both Corps extend back to World War I, in which V Corps operated on the battlefields of Lorraine, St. Mihiel and the Meuse-Argonne, while VII Corps was organized in France a few months before the Armistice. In World War II, the tide of battle carried V Corps from Normandy, Northern France, the Rhineland. Ardennes-Alsace and thus into Central Europe. The combat records of the three infantry and two armored divisions forming Seventh Army's basic grand forces are equally impressive. In Europe and in the Far East the records run from Normandy to Sicily, from New Guinea to Korea. They have a fighting tradition and the esprit de corps that is an ever-present stimulus to always greater accomplishment. The United States Army, Europe trains and studies constantly. Tactical training runs the gamut from qualification in individual weapons to participation in large-scale, multi-national NATO field exercises. And the fact that USAREUR's role in the defense of Europe entails efficient operation not only as a national military organization but also in partnership with our allied companions in arms, sets up additional problems in the field of inter-allied military relations. Not only is the United States Army, Europe almost constantly in the field; it can also be said to be almost constantly in the military classroom. Much technical training is needed to produce the specialists needed by today's Army in electronics, special weapons, modern supply techniques, and intelligence. This training is provided by a USAREUR-operated service school. TO explain USAREUR's position in relation to the national defense organization and to its mission with NATO, it is necessary to show something of the interlocking nature of our command structure. Since there is a unified United States Command in Europe which groups all U. S. Armed Forces here under one commander, USAREUR - like its sister services, the United States Air Forces in Europe, and the United States Naval Forces - reports to the United States European Command (USEUCOM). DIRECTING all of USAREUR's activities in the three countries in which its troops are located - West Germany, France and Italy - is the Commander in Chief (CINCUSAREUR) and his staff at headquarters in Heidelberg, Germany. The standard organization of a major headquarters is used, comprising a general staff, a special staff, and specialized agencies, totaling more than a score in all. 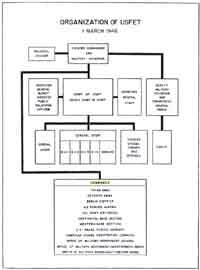 In order to achieve both maximum efficiency and maximum economy, all headquarters elements are not located in one place, but rather where they may perform their operations to the best advantage. ONE of the axioms of good management procedure is that in order to manage effectively, the limitations of the "span of control" must be recognized. There is a limit to the number of activities that an individual can direct personally and still achieve effective results. In line with this theory, CINCUSAREUR therefore requires only six major commands to report directly to him. In addition to the Seventh Army already described, these are: the Berlin Command, Northern and Southern Area Commands, the U. S. Amy, Europe (Rear) /Communications Zone, and the U. S. Army Southern European Task Force. Berlin Command comprises the U. S Sector of the divided city. Our military personnel there represent the only U. S. Occupation Force still in existence as a result of World War II. 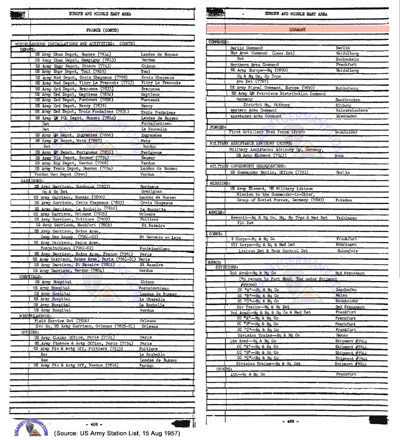 Northern and Southern Area Commands. In Germany, USAREUR's area of operations is divided into area commands - Northern and Southern. Each of these area commands provides administrative and logistical support for all U. S. Army personnel within its borders, with the exception of medical services, which are provied for the most part by units assigned to a U. S. Army Hospital Center. Communications Zone. During the first six post-war years, U. S. forces in Europe were supplied mainly through the north German port of Bremerhaven. During those years when the threat of Communist expansion had not become fully apparent, the fact that this line of communication from the North Sea to Bavaria ran parallel to the front of a potential aggressor was deemed of small importance. The growing threat of invasion from east of the Iron Curtain, the buildup of East German and satellite forces, the blustering attitude of the Kremlin, and overt operations such as the blockade of Berlin, made painfully obvious the need to establish supply lines far less vulnerable to direct attack. Thus a new Communications Zone --third in the generation of COM Z's -- was brought into being. An agreement, worked out in six months of delicate negotiations with our NATO ally, France, permitted the use of port facilities, storage depots, space for more depots, and transportation rights on French roads and rail lines to West Germany. For nearly five years COM Z personnel built, improved facilities, and expanded their capabilities until, by mid-1956, they were able to assume the full burden of logistical support for USAREUR. The responsibilities of COM Z were then extended to include the operation of supply installations in the German Federal Republic. 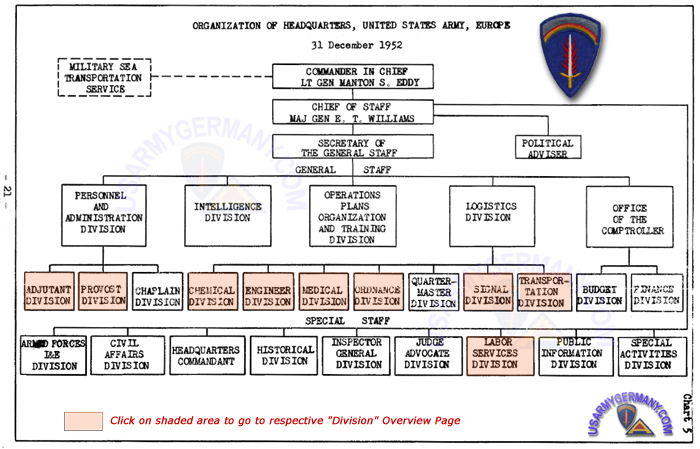 In 1959, more and more of USAREUR's technical service activities and divisions were being shifted to the control of the Commanding General of COM Z. 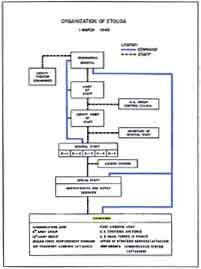 The operation of a supply system as complex as this involves, fast of all, skilled manpower, and second, efficient organization. Today this Communications Zone has two major elements - Theater Army Support Command and Port Area Command. There are, in addition, two special commands with responsibilities peculiar to themselves - the Orleans Area Command, which supports the COM Z headquarters at Orleans, and the Seine Area Command, which supports the U. S. EUCOM headquarters and the United States elements of the Supreme Headquarters, Allied Powers, Europe. Completing the structural framework of the Communications Zone are its four posts - Poitiers, Bussac, Toul and Verdun. 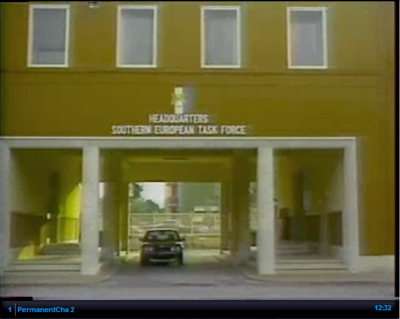 The U. S. Southern European Task Force located south of the Alps, in Italy, is another major element of USAREUR. 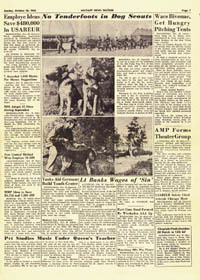 Activated on 25 October 1955, SETAF is unique among U. S. Armed Forces in that its primary reason for existence is the support of the land forces of another nation. It is, first and foremost, a missile command designed to support, in time of war, the ground forces of Italy. Three distinctive conditions apply to this organization -- geographical, military, and administrative. Militarily and geographically, it is a member of the SHAPE (NATO) team, reporting to Allied Land Forces, Southern Europe (LANDSOUTH) and in time of war it would immediately become a LANDSOUTH element. As a member of the USAREUR team, however, SETAF reports to CINCUSAREUR on U.S. Army Command and administrative matters. THE relationship of the United States Army, Europe with our allies in NATO is a relationship based on treaties and working agreements dating back to the inception of NATO. USAREUR is America's contribution - in being - to the land strength of the NATO Alliance. This contribution comprises at least one-sixth of the ground forces regarded by General Lauris Norstad, the Supreme Allied Commander, Europe, as necessary for the defense of western Europe. This force is committed to NATO. In the event of aggression - or to speak bluntly war - the Supreme Allied Commander Europe (SACEUR) takes over control of the allied forces. SACEUR has under him four major commands. They are: Allied Forces Northern Europe (AFNORTH), Allied Forces Central Europe (AFCENT), Allied Forces Southern Europe (AFSOUTH), and Allied Forces Mediterranean (AFMED). The headquarters of the Allied Forces Central Europe are at Fontainebleau, France. Under this command come the Allied Land Forces, Central Europe, divided into the Northern Army Group and Central Army Group - NORTHAG and CENTAG. It is with CENTAG, this Central Army Group, that we are now concerned, for the Commander in Chief USAREUR is also the Commander of the Central Army Group. His headquarters is in Heidelberg - almost at the geographical center of the area of USAREUR's responsibility. Incidentally, to illustrate the international quality of the command, it is significant that AFCENT is commanded by a French General, LANDCENT by a German General, and CENTAG by an American General. The Central Army Group comprises German, French, and American elements, training together, working , exercising together, and together developing a smoothly operating machine which is slowly but surely reaching a peak of combat efficiency by any standards. In time of war, CENTAG would embrace three major commands -- Seventh Army, First French Army, and II and III German Corps. BECAUSE of the amazing advances of the German elements within the NATO organization, it may be well to describe further their organization and training, side by side with our American divisions. When the Gamin Federal Republic became a sovereign state in 1955, she had not even the nucleus of an armed force, nor the means of arming, equipping or training such a force. Within the space of less than six years, she has brought into being seven divisions which are now assigned to NATO. The German divisions working with us are: The 2d Armored Infantry, the 4th Armored Infantry, the 5th Panzer Grenadier Division, and one Mountain Division. In addition, there is a German airborne brigade. This is the army of a democracy. Its duties and responsibilities are clearly defined, both in the international agreements surrounding Germany's adherence to NATO, and in the laws of the German Federal Republic. Germany looks to her legitimate defense requirements entirely within the multinational structure of the Atlantic Alliance. Her army contributes substantially not only to German defense but to Allied defense as a whole. The relationship between the German and American components of CENTAG has been cordial, understanding and, from a training standpoint, highly successful. The German soldier himself is dignified, imbued with a sense of responsibility, responsive to command, and devoted this task. The French elements over which CENTAG has command are less in evidence than the Germans, and for sufficient reason France, engaged in a long and painful Algerian war, had been forced, very early in the history of NATO, to withdraw some of her strongest fighting forces to North Africa. Her remaining forces, however, are very much in the picture and, in the event of war, would definitely be brought to the full strength of her commitment. The presence of our American troops in Germany and France has, of course, brought its problems of community relations. But it can be said that, through the years, and despite "incidents" that from time to time have resulted in local disturbances, the relationship between the American fighting man and the citizens of our host countries has been one of friendship, understanding and comradeship - an amazing phenomenon when one considers the years of transition from war, to occupation and to partnership in defense. As the Heidelberg Herald-Post went to press, a unit redesignation and change of command ceremony was scheduled for April 15 at Campbell Barracks. Maj. Hugh F.T. Hoffman lll, who was the installation coordinator at Campbell and who is the deputy USAREUR headquarters commandant, will assume command of Headquarters and Headquarters Company, USAREUR and 7th Army, (Provisional) from Capt. Steve A. Redding, who was the Company A, 26th Support Group commander at Patton Barracks. "The changeover is an idea that has been bantered around for quite awhile," said Maj. Chris Clarke, the 26th Support Group plans officer. "The offices will be nearer to the people they serve. The orderly room, supply, training and NBC (nuclear, biological and chemical) rooms will be colocated with the soldiers near their work offices, instead of on Patton Barracks." Billeted soldiers will still reside on Patton. The Headquarters and Headquarters Company mission, like the deactivated company's, is to provide command and control, tarining support and personnel services to Headquarters USAREUR. "The Support Group's personnel actions staff is providing the redesignated administration people with information on how to set up a personnel actions center," said SFC Johnny Graham, assistant personnel staff NCO at the 26th Support Group. "Before, every USAREUR staff element handled personnel actions for its own people. Soldier's administrative actions had to go through their office's officer in charge, then the Company A orderly room and finally the 26th Support Group or battalion personnel actions center. Now, the personnel actions will all go through a centralized PAC at HHC, USAREUR and 7th Army (Prov. ), which will provide a more timely and consistent paperwork flow." Some actions requiring additional processing will still be sent to the Support Group. In addition, HHC will handle the directorates' organizational equipment (war equipment) through its own property book office instead of through the Consolidated Installation Property Book Office. The purpose of this is to make them more combat ready. The changeover will take several months. "There will be a transition period to gradually take over the administrative and logistical actions from the directorates, selecting each or some directorates at a time. By Oct. 1, HHC USAREUR and 7th Army (Prov.) should be able to handle all of those actions," Clarke said. "Where Company A was like a liaison between the USAREUR staff and the 26th Support Group, HHC USAREUR and 7th Army (Prov.) will be more directly involved with the paperwork flow aspect of providing support to the troops in USAREUR," Graham said. 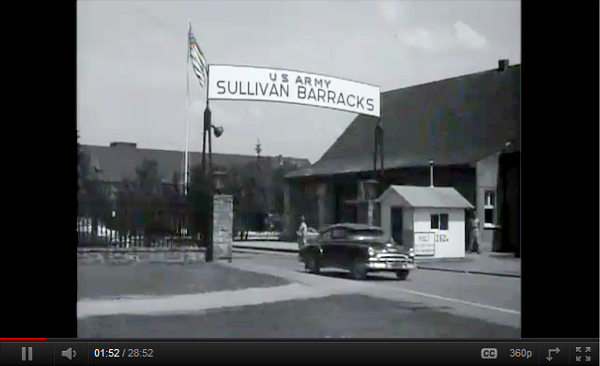 Before the changeover, enlisted soldiers assigned to USAREUR directorate staffs were attached to Company A on Patton Barracks for billeting, housing, rations, training and legal actions. Officers were assigned to Headquarters USAREUR. More than a dozen cadre were "permanent party" or assigned to Company A. Assigned enlisted soldiers as well as officers to Headquarters USAREUR will be attached to HHC USAREUR and 7th Army (Prov.) for those administrative actions, making the headquarters company one of the largest in the Army, officials say. Nov 7 Yugoslavia. First Hostile Encounter of Cold War. Incident at Nis. P-38s from U.S. 82nd Fighter Group squadrons mistakenly attack a Soviet column, killing 31 Soviet soldiers on the ground. They then shoot down 3 Soviet fighters. 2 U.S. pilots KIA. May 8 - Nov 30 Czechoslovakia. U.S. troops, peaking at 22,023 in September, face off against the Soviets along a 266-mile demarcation line in Bohemia. May 23 - Jun 14 Yugoslavia Border. U.S. 85th ID moves into the Italian province of Venezia Giulia along the Morgan Line to counterbalance the Communist Yugoslavian 4th Army. It remains on a 23-day alert status. 91st, 34th and 10th Mountain divisions also serve in the area. Oct 3 Yugoslavia Border. 88th ID takes over U.S. sector of Morgan Line. Dec 23 Germany - Berlin. 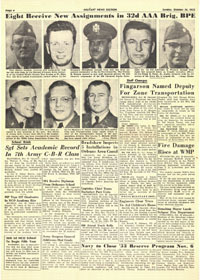 2 GIs of the 78th ID are killed near Tempelhof Airport. Dec 24 Yugoslavia Border. 1 GI of Co. E, 349th IR killed by Yugoslav partisans. Feb 9 Soviet Union. Stalin effectively declares on the West. He does so in a Moscow speech. Feb 10 Czechoslovakia. 12 Americans infiltrate on an intelligence mission - 3 are captured and held for 21 days. 1 GI of the 126th Combat Engineer Bn. earns a Soldiers Medal for heroism. Mar 3 Germany - Berlin. 1 Army ordnance officer is killed by a Soviet sentry. Jul 12 Yugoslavia Border. Firefight at Ursina 8-man squad from L Co., 351st IR, is ambushed. U.S: 0 Yugoslavs: 2 KIA. Jul 16 Yugoslavia Border. 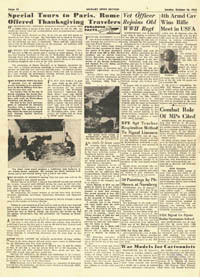 1 GI is killed along a road from Trieste by Yugoslav Partisans. Aug 9 Yugoslavia Border - Ljubljana. U.S. C-47 transport is forced down by Yugoslav aircraft: 7 airmen briefly held captive. B-17s begin flying the route, with gunners ordered to "shoot if interfered with." B-17 flights end Oct. 23. Aug 19 Yugoslavia Border. U.S. transport of the 305th TCS is shot down by a Yugoslav plane, killing the 5-man crew and causing an international incident. Oct Yugoslavia Border. 88th 10 (11,352 men) is the only division in the entire U.S. Army at full operational strength, as a result of tensions with the Yugoslavs. Mar 12 Europe. Truman Doctrine. U.S. officially declares "war" on Soviet expansion and subversion. Sep 15 Yugoslavia Border. Outpost 5 3 GIs of Co.B, 351st IR, are captured by Partisans and held for 5 days. Jul 8, 1948 - Jul 12, 1949 Germany - Berlin. Berlin Airlift. 31 U.S. airmen die in 12 fatal accidental aircraft crashes during Operation Vittles between these dates. 733 incidents of Soviet harassment in the air reported. Jul 17 Britain. 60 B-29 bombers of SAC's 28th & 307th BGs arrive at Marham Royal Air Force Base. Oct 30 Austria - Vienna. 1 U.S. diplomat is abducted and beaten to death by Soviet NKVD. Dec 10 Czechoslovakia - Ceska Kubie. 2 GIs of the 6th ACR are captured and not released until February 1949. Jan 22 Greece. 1 U.S. Air Force officer is captured and KIA by Communist guerrillas after his AT-6 is shot down by ground fire while directing a strafing mission. Apr 8 Baltic Sea - Latvia. Soviet fighters shoot down a PB4Y (Det. A, VP-26): 10 KIA. May 18 Azores - Lajes. 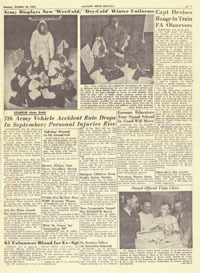 B-29crashes: 16 crew die. May 3 Austria - Vienna. 1 soldier of the 796th MP Bn is killed by two Soviet soldiers. Apr 26 Atlantic. USS Hobson collides with the carrier Wasp: 176 destroyermen die. Mar 10 Germany - Regensburg. F-84 of the 36th Tactical Fighter Wing is shot down by 2 Czech MiG-15s in German airspace. Pilot parachutes safely. Aug 12 Czechoslovakia. Czechs shoot down 2 U.S. trainer planes: pilots are held until fall. Aug 11 Germany - Karlsruhe. Largest Accidental Death Toll: 66. 2 C-119s collide, killing 56 soldiers of A Co., 499th Eng. Bn. 555th Eng. Grp. and 10 Air Force crewmen. Oct 23 Germany. Hungarian Uprising.U.S. 6th ACR on full alert for a week and moves to the German border. Nov 17 Germany - Kaiserslautern. U-2A (WRSP-1) explodes in mid-air- pilot dies. Dec 23 Albania. U.S. T-33 is shot down: Pilot survives. Aug 2 Lebanon - Beirut. 1 GI of 24th Airborne Brigade is KIA by Moslem snipers. 4 U.S. servicemen die in accidents during Operation Bluebat, launched to pre-empt Soviet interference in the region. Sep 2 Soviet Union - Armenia. Worst Single Cold War Hostile Loss in Europe: 17 KIA. 4 Soviet MiGs shoot down an Air Force recon plane of the 7406th Support Squadron, killing 6 crewmen and 11 members of the USAF Security Service's Det 1, 6911th Radio Group Mobile. A C-1 18 was shot down over Armenia on June 27: all 7 crewmen were released July 7. May 29 Iceland Coast USS Grenadier forces a Soviet sub to the surface for the first time ever. May 1 Russia - Sverdiovsk. U-2 (WRSP-2) is downed by a missile over Ural Mts. 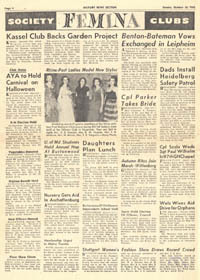 Pilot held until Feb. 10, 1962. May 25 Germany U.S. C-47 is shot down over the East: All 9 aboard survive. They are released July 19. Sep 2 Germany - Grafenwoehr. An errant artillery round kills 17 and wounds 25 men of D Trp., 3rd Recon Sqdrn., 12th Cav, 3rd AD, during Operation Winter Shield. Jan 15 Atlantic. 75 miles east of Barnegat Island. "Texas" Tower 4 (designed to warn of a bomber attack) sinks during a storm: 28 die--14 airmen +14 civilians. Aug 20 Germany - Berlin. Berlin Crisis. 1st BG, 18th IR (1,500 men), convoys along the Helmstedt-Berlin autobahn in a show of force in response to the erection of the Berlin Wall 7 days earlier. Oct 26 Germany - Berlin. Checkpoint Charlie Co. F, 40th Armor, backed by Co. E, 2nd BG, 6th IR, stands down the Russian tanks for 16 hrs. Dec 4 Armed Forces Expeditionary Medal is created by executive order to recognize vets of Cold War Operations. May 22 Germany - Munich. A mid-air aircraft explosion claims 26 lives: 22 men of VQ-2 + 4 Army specialists. Apr 10 Atlantic. 220 miles east of Boston. USS Thresher sinks, after a piping failure, with 129 men: 112 crew members +17 civilian workers die. Jan 28 Germany - East. Soviet fighters shoot down a U.S. T-39 training plane of the Wiesbaden Air Base Group: 3 KIA. Mar 10 Germany - Gardelegen. U.S. RB-66 10th TRW is shot down. The 3 crewmen survive. Jan 16 Spain - Palomores. B-52 collides with K-13 tanker while refueling: 7 men die. May 27 Atlantic - Off Azores. USS Scorpion sinks with crew of 99. Cause unknown. Aug 20 Germany. Czechoslovakia Invasion. 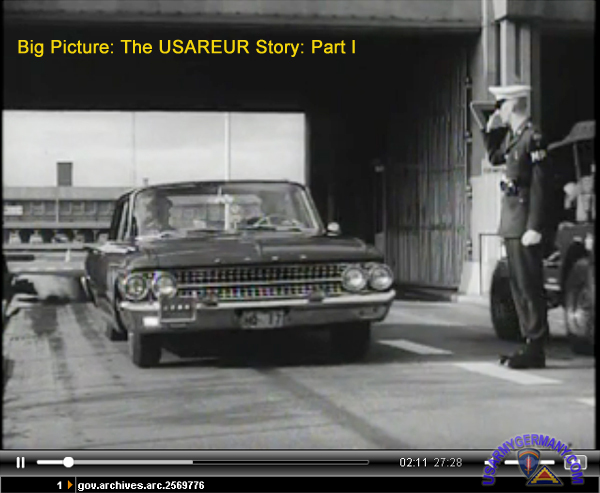 U.S. 2nd ACR goes on alert when Warsaw Pact forces invade during the Prague Spring. Oct 21 Soviet Union - Armenia. Soviets shoot down a Air Force U-8: 4 crewmen survive. May 11 Germany - Frankfurt. Red Army Faction (Germany Marxist terrorists) explodes a bomb at V Corps HQ: 1KIA and 13 WIA. May 24 Germany - Heidelberg. Marxist RAF bombs U.S. Army HQ: 3 KIA, 5 WIA. Oct 6 Mediterranean Sea. 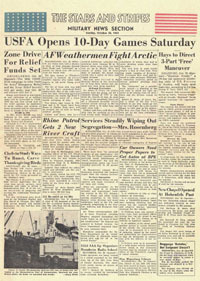 6th Fleet on Defense Condition 3 Alert for 26 days in response to Soviet moves during Arab-Israeli war. U.S. Navy tracks 26 Soviet subs. May 29 Germany - Winterberg. U-2 (349th ) crashes. Dec 7 Cyprus - Akrotiri. U-2 (99th SRS) crashes on take-off, killing 5: pilot and 4 groung crewmen. Apr 12 Turkey - Izmir. 1 U.S. airman is killed by Turkish Marxist terrorists. May 15 Arabian Sea. Planes from the USS Midway take to the sky when 2 Soviet IL-38s circle the carrier. Dec 10 Germany. Soviet Union threatens to invade Poland. U.S. deploys 4 E-3A planes. Aug 31 Germany - Ramstein. Marxist RAF bombs Air Force HQ: 17 WIA. Nov Germany. During NATO's exercise Able Archer, Warsaw Pact units go on full alert, believing the West is about to launch a preemptive nuclear strike. Aug 8 Germany - Wiesbaden. 1 GI is killed by the Marxist RAF. Mar 24 Germany. Last U.S. KIA of the Cold War in Europe is part of the U.S. Military Liaison Mission in East Germany, is shot dead by a Soviet sentry in Ludwigslust. This officer was posthumously awarded the Legion of Merit & Purple Heart. Apr 14 Italy - Naples. 1 U.S. servicewoman is killed by Marxist terrorists. June 28 Greece - Athens. U.S. defense attache is killed by Greek Marxist terrorists. Nov 9 Germany - Berlin. Wall Falls. B. Co., 6th Bn., 502nd IR, is the U.S. infantry unit on duty at the time. Signals the effective end of the Cold War in East Europe. Mar 1 Germany - Fulda Gap. Last Patrol. 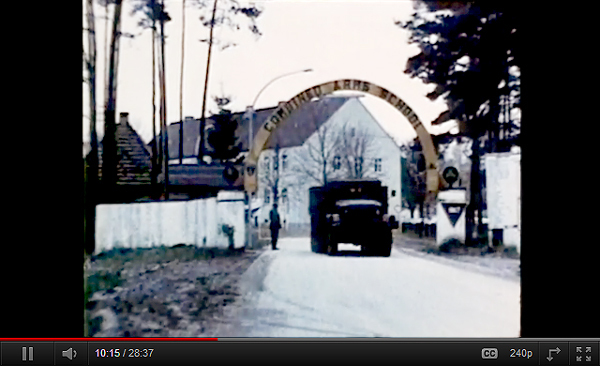 11th ACR conducts the final border patrols of the Cold War in Europe. Mar 12 Greece - Athens. 1 U.S. airman is killed by a Greek Marxist terrorist bomb. Dec 25 Soviet Union - Moscow. Communism Collapses. USSR ceases to exist. 301st Radio Broadcasting and Leaflet Group - 301st RB&L Group was the first PSYOP unit deployed to Germany during the Korean War.